For the umpteenth time, Kenya football fans were subjected to yet another humiliation. This time it was against Botswana in a 2016 Olympics qualifier. Kenya went down 0-3 in the first leg match played in Gaborone. All three goals were scored in the second half. Team Kenya arrived in Botswana on the same day as the match. This was after a 4 hour flight from Nairobi to Gaborone. After arriving in Gaborone, they had to then travel by bus to Lobatse city. It comes as no surprise therefore that the team was fatigued due to the travel. They were also likely still suffering the effects of jet lag. And on top of this, the team did not have a chance to hold any training sessions in Lobatse in order to acclimatize, get a feel of the pitch or even just stretch their legs. All these factors contributed to their poor performance, especially the fatigue. Team Kenya valiantly held off Botswana in the first half. 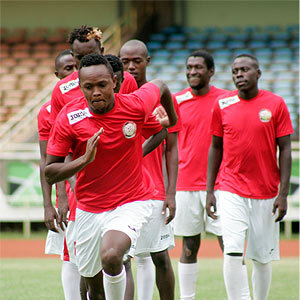 But fatigue eventually took its toll and Kenya succumbed, conceding three rapid fire goals in the second half. When players are fatigued not only can they not play to their physical potential, but they also cannot play with concentration. And frustrations tend to rise, which may explain why Timonah Wanyonyi was red carded for a retaliation, which compounded matters for Kenya because it left them with 10 men. Wanyonyi will now miss the return leg further denting Kenya’s hopes as he is one of the best players on the team. The blame for this debacle lies squarely with the FKF team of Sam Nyamweya, Robert Asembo and others. They had several months to plan travel arrangements but it is not clear what they were doing. They spend so much time fighting for their own interests that they forget to do basic organizational duties. Reports from local media suggest that, Football Kenya Federation had made frantic efforts to have the match postponed after failing to get acquire a transit visa that would have enabled the team to pass through South Africa to Gaborone. According to Botswana media, the Botswana FA declined to change the dates because FKF’s request was put in late. Botswana Football Association president, Tebogo Sebego, said the request by Kenya came too late to be considered. “We were unable to postpone the game due to logistical reasons. Our stakeholders were already invited. “The Kenyan Federation pleaded with us to postpone the match on Wednesday, and it was too late. “If they had told us on time, we could have considered their request,” Sebego said. But why would Botswana do Kenya any favours when they are trying to eliminate them? How many more times will Kenya be derailed? This lack of attention to detail has derailed Kenya so many times. Last year Kenya was eliminated by Lesotho from the 2015 AFCON qualifiers because the team was poorly prepared. Most notably, the team members were pleading for friendly matches in order to gel. But their pleas fell on deaf ears. When Kenya was eliminated by Lesotho, coach Adel Amrouche was scapegoated by Nyamweya and fired. So furious is Amrouche today that when his name came up as a potential candidate for the AFC Leopards coaching job, he quickly dismissed it saying he wants absolutely nothing to do with football in Kenya. With the qualifiers for the 2017 AFCON looming, it is unlikely that FKF will come up with better organization. Kenya last qualified for AFCON over 10 years ago and each failure has been largely due to poor organization. This entry was posted in Kenya Football News and Commentary, Kenya Sports news and commentary and tagged Adel Amrouche, Bobby Williamson, harambee stars, Kenya U23, sam Nyamweya. Bookmark the permalink. Is this Sam Nyamweya really Kenyan and human? How does he feel when all Kenyans are crying over the state of dwindling football because of him? Is he really Kenyan?